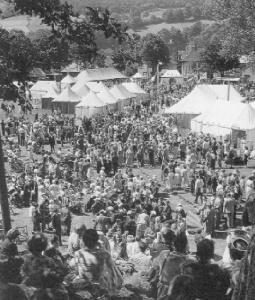 In January 1947 J. Scott Archer, who was a keen local worker for the festival, introduced his friend R.M. Rossetti of Rhosllanerchrugog, a leading international figure in the Esperantist movement (attempting to establish Esperanto as a common European language). 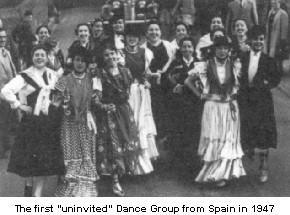 Although it was strictly a choral festival, the group of Spanish dancers arrived, mistakenly hoping to compete! They were given the stage during an evening concert, and were such an outstanding success that Folk Dancing was added to the Syllabus for 1948 and that competition since then has been one of the highlights every year. It was July, 1949, when a Welshman named Hywel Roberts found himself compere of the International Mixed Choir Competition – a difficult situation for the young man because, on the last day of World War Two, his brother was killed in action on German soil. And, about to mount the stage to hear his introduction, was the Luebeck Choir from West Germany – the first Germans seen in Llangollen since the war had ended. Aware of Hywel Robert’s dilemma, the audience waited anxiously to see how he would cope with his personal tragedy. They were electrified to hear him make a moving appeal for the Luebeck Choir to be greeted as “our friends from West Germany”. It was a sensational moment in the history of the International Eisteddfod, and one which will never be forgotten. A member of that audience recalls, “There wasn’t a dry eye in the house. It was several minutes before the Luebeck Choir – aware of the delicate situation – recovered sufficiently to perform”. The spirit of that moment has lived on. The people of Luebeck took Hywel Roberts – who died in 1989 – to their hearts, and began a continuing friendship with him and the International Eisteddfod. The climax of their affection for Hywel was demonstrated in 1988 in a special civic ceremony when Luebeck made him a Freeman of the city. 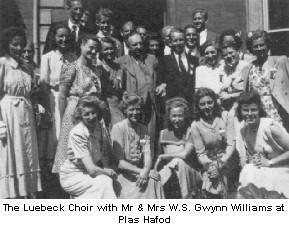 Mrs. Beti Gwynn Williams comes from Abergele and met her husband in the early thirties. An accomplished professional singer, her beautiful contralto voice was heard in the Thursday Concert of the first Eisteddfod.